From Claudette Colbert's forgotten legs to glamour shots of Tyrone Power, here's what was happening in the fan magazines of September 1940. There were five major movie fan magazines operating in the fall of 1940: Modern Screen, Silver Screen, Hollywood, Screenland, and Photoplay. Each one had their one distinct image -- for example, Screenland had exceptional photography, while Hollywood was good at gossip -- but, while looking through the archives at the Media History Digital Library, I found that all of these magazines had remarkably similar coverage each month; in fact, most of the magazines shared stories on the same stars and even ran the same ads. So, with that in mind, here's a rundown of what was happening 75 years ago. Note: Each link will take you to a random spot in the September issues and you can flip back and forth through the magazines. The Cover Story: Modern Screen's cover (at the top of the article) featured a lovely portrait of Claudette Colbert. Inside, Modern Screen correspondent James Reid treated readers to an article on the hot topic of "Claudette Colbert's Forgotten Legs." The in-depth piece (seriously, it's like 3,000 words) compares Colbert's stems with other famous actresses like Ann Sheridan and Betty Grable and provides testimonials on the appeal of Colbert's legs from the likes of famed columnist Walter Winchell. 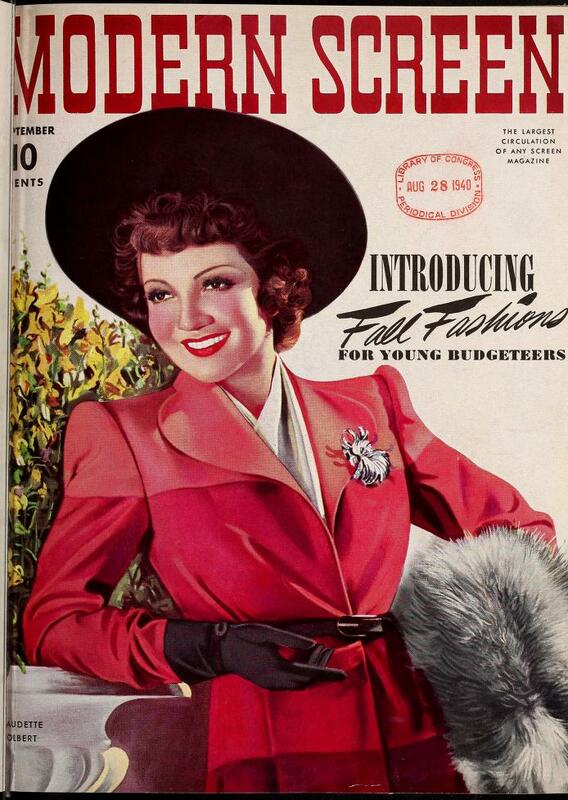 Fashion: I'm sure there were all types of readers of fan magazines, but the articles were geared towards women. 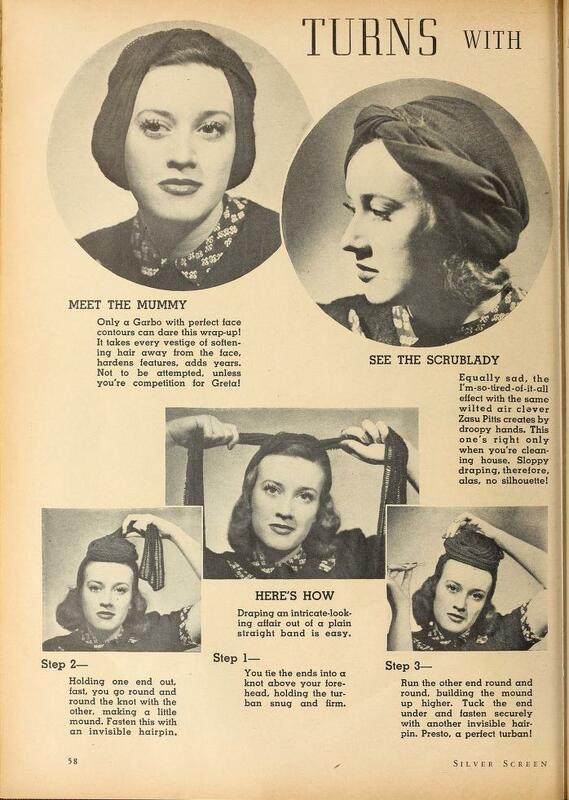 This Silver Screen article shows ladies how to wear turbans just like their movie idols Greta Garbo and ZaSu Pitts. Photos: I have to confess that I'm partial to Screenland because of their abundance of glossy photos. One of my favorite features is Screenland's Most Beautiful Still of the Month. 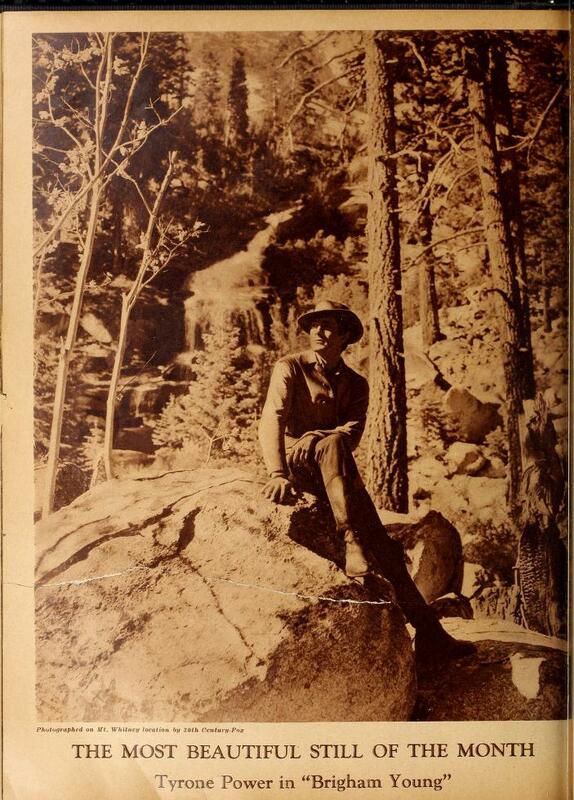 In September, they featured Tyrone Power on location on Mount Whitney for the biopic Brigham Young. Private Lives: The fan magazines also gave curious readers a glimpse into the private lives of their favorite stars. 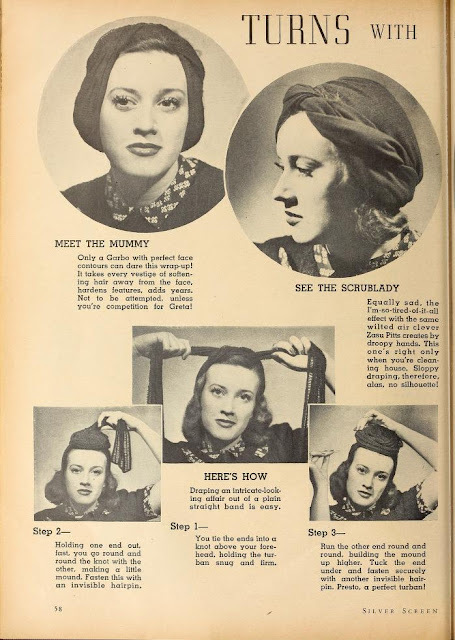 Photoplay ran a regular feature called Hollywood at Home. 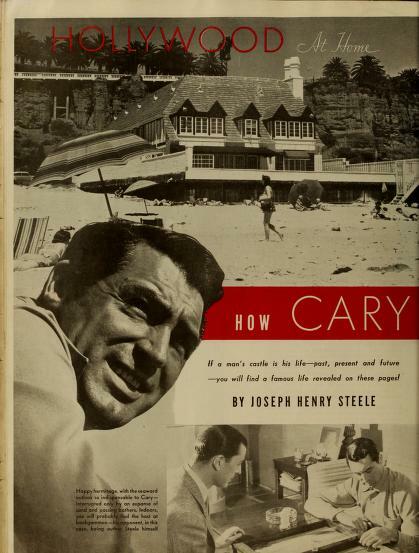 September's issue covered Cary Grant's beach side manse. Things I learned: The thoroughly English Grant had Spanish ancestors, and his preferred method of travel was chauffeur-driven limousine (but hey, whose isn't). Romances: Then as now, the fan magazines took an active interest in the love lives of their favorite stars. 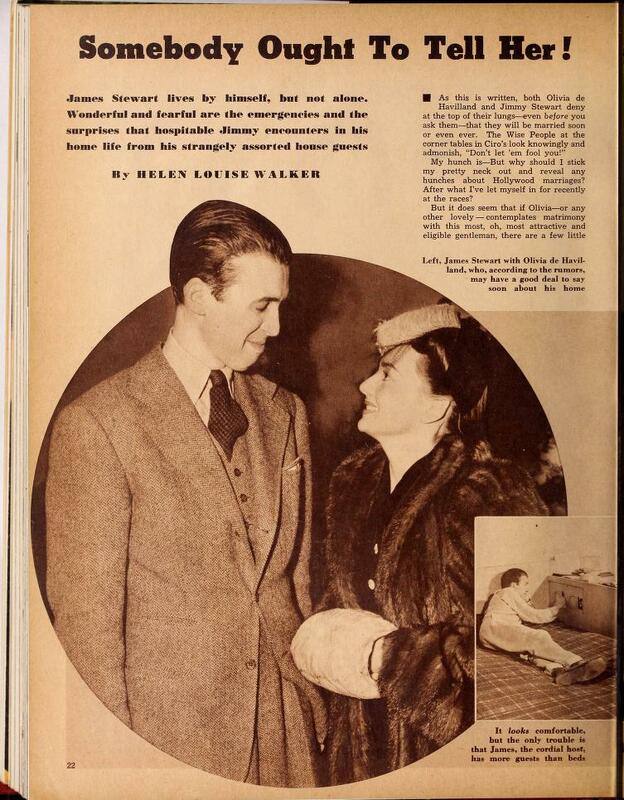 One of the hot couples of 1940 was James Stewart and Olivia de Havilland. They were mentioned in gossip columns in several magazines, but Hollywood featured an article, "Somebody Ought to Tell Her!" about their relationship. Breathless correspondent Helen Louise Walker writes about Stewart's confirmed bachelor ways, wondering if he would ever settle down. Of course, Stewart married his wife, Gloria, in 1949, and was a devoted father and husband. 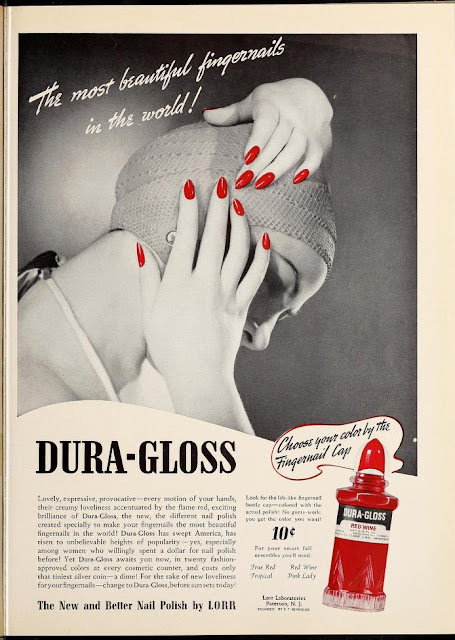 I'll leave you with this beautiful ad for Dura-Gloss nail polish, but there's a lot more in these magazines including a glamorous photo shoot of Margaret Sullavan, speculation on whether Melvyn Douglas was a Communist, and Ginger Rogers as a brunette. Also if you go to the Media History Digital Library's main page, you can find ways to support this worthwhile organization. I love the layouts of the old fan magazines and just everything about them. That Tyrone Power picture is something I would have clipped out and pasted on my wall. As for that 3000 word article on Colbert's legs, that author sure must have been an authority on gams!